Fungal infection can affect people of all ages. It will cause a rash or blisters with itching, dryness, redness, flaking, and sometimes moist white skin between the toes. How did I get this? 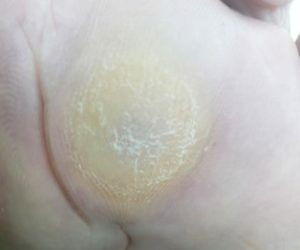 You can pick up a fungal infection anywhere, however they are more common in warm moist environments where there are communal barefoot areas. Care should be taken when using foot spas if they are shared with other people. Various treatments are available from the pharmacy. Most require an application of an antifungal cream or spray as often as twice a day. Use footwear that will allow your feet to “breathe” and moisture “Wicking” socks or natural fibres are next best. Wear thongs or water shoes in the shower to prevent infecting others. What help can I get for this? Your Doctor or Podiatrist will be able to help if you are not sure of the cause of your rash, or if it has not cleared up after 4 weeks. Sometimes a skin sample can be sent to the lab for testing. Your podiatrist can advise you about disinfection of your footwear and hosiery. When will it get better? With the right treatment, fungal infections will usually clear up in a few weeks. More stubborn infections can keep coming back and may require further investigation. This entry was posted in Uncategorized on January 16, 2017 by admin. Often very painful, a blood blister under your toenail will cause swelling and bruising under and around your toenail. Usually a result of trauma, you may have stubbed your toe, dropped something on it, or been stood on. You may also see this condition after endurance events e.g. running or hiking, or after wearing shoes that sre too small. If you are taking anticoagulant medication you should take extra care. Painkillers may help, but avoid those containing anti-inflammatories such as ibuprofen. Piercing the toenail to release the pressure will give immediate relief, but this should be carried out by a medical professional if possible. Your Doctor or Podiatrist will carefully release the pressure and fluid from beneath the toenail, and advise you on appropriate dressings. Your podiatrist can help if the toenail comes loose, or is not growing properly. Releasing the fluid from beneath the toenail usually gives immediate relief. Sometimes you will lose the toenail, but it should grow back again. Can also be passed on within families. Fungal nail infection becomes more common as we get older. It appears as a white or yellow/brown discolouration of the nails. Lots of people get changes to their toenails however only about half are because of Fungal Infection. Nail fungus can be picked up almost anywhere, however it is more common in warm moist environments. 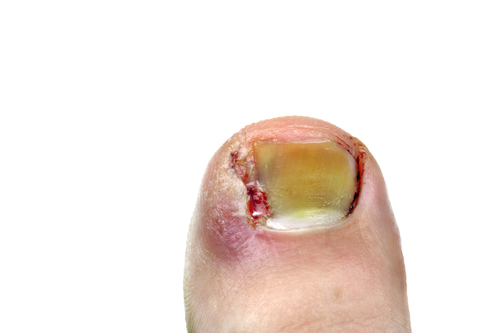 The fungus can enter through the skin folds around your nail, through a split or damaged nail, or under the end of the toenail. People who are run down, or suffering from other health problems may be more susceptible. Care should be taken when visiting nail spas to ensure equipment is clean prior to use. Various treatments are available from the pharmacy. Most require an application of antifungal nail paint as often as twice a day, and some also include files or other means of helping the paint to penetrate. Using nail varnish to hide the problem will also seal the infection in the nail and tends to make it worse. Your doctor may prescribe antifungal medication. Oral treatments may not be suitable for people with other health problems. A Podiatrist will help by carefully removing any infected nail tissue and advising on treatment options. This might include Photodynamic Therapy or Laser treatment, and should also address disinfection of your footwear and hosiery. Treating Fungal Nail Infection can take many months, perhaps up to a year. Any treatment will require the nail to re-grow until it is clear of infection. Painful thick skin between the toes. The worst cases may blister and form a wound. Increased pressure between your toes possibly caused by any or all of the following: tight shoes, bony lumps, enlarged joints, thick toenails. Padding between the toes can help prevent recurring problem. Careful Shoe fitting to ensure room for your toes and secure fit. Orthopaedic surgeon can operate to reduce bony lumps. 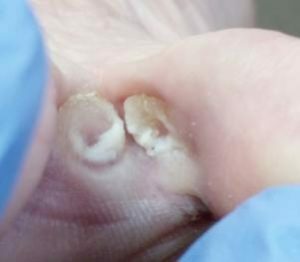 Ingrowing toenails occur when the hard nail plate causes a wound in the soft flesh around the nail. They can be very painful and become infected. There may be an overgrowth of tissue around the nail due to irritation of the wound. Swollen toes and sweaty feet can weaken the skin around the nail. Avoid footwear which presses on the toe. Bathe the foot in salt water and apply an antiseptic dressing. A podiatrist can remove the part of the nail that is causing the problem. This may be done under local anaesthetic if necessary. A Podiatrist can advise on appropriate footwear and how to avoid further problems. Without treatment the nail will continue to grow and penetrate the wound. Removal of the piece of nail provides immediate relief. This entry was posted in Uncategorized on September 15, 2016 by admin. Welcome to uminapodiatry. This is your first post. Edit or delete it, then start blogging! This entry was posted in Uncategorized on February 2, 2015 by admin. Your Foot Pain. 2015 All Rights Reserved.